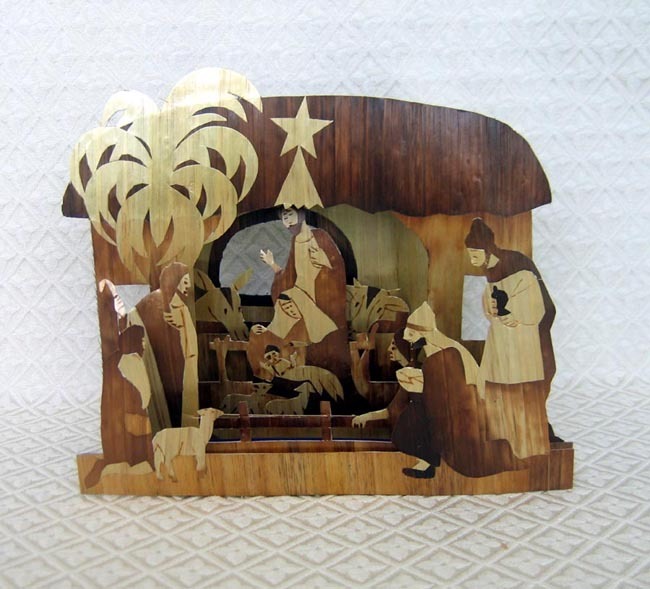 This intricately detailed Nativity card is made from wheat straw in Bangladesh. Its dimensions are 9 inches long by 4 inches wide by 8 inches tall. Artisans cut and flatten wheat straw and scrape it with a knife to make it even. For larger pieces, wheat straw strips are fixed to paper to form a sheet from which designs are cut. For more detailed designs wheat straw is cut into thin strips, which are pieced together in layers. Artisans apply heat in varying degrees to bring about the range of tones from light tan to dark brown or black. Finally, they cover the cardboard base with cloth to complete the item. Craftspeople use simple tools: a flat board, a pot of glue, a sharp blade and a pair of scissors. Rishilpi, a nonprofit, nongovernmental development organization in southwest Bangladesh was founded by two Italian missionaries who wanted to improve the lives of people of the “untouchable” Rishi caste. Embroidery, wheat straw, palm leaf and jute sections provide work for poor women from rural villages who have been widowed or abandoned. Some women twist jute into cord at home and others knot macramé crafts at the center. Men at the Rishilpi leather center, many of them disabled, fashion wood and leather products. Rishilpi Development Projects provides much needed income to more than 2,000 people who would otherwise be outcasts in the community. The Rishi were systematically denied any access to education, medical care, and virtually all other social services. They continue to suffer from severe discrimination and are among the poorest groups in this very poor nation. Most people call it the “untouchable” class because its members are forbidden to touch anyone who belongs to one of the four varnas. Untouchables do all the most unpleasant work in South Asia. They are forced to live on the outskirts of towns and villages, and they must take water downstream from and not share wells with varna Hindus.